you! This book will blow your mind. Why? -- you keep asking. stopping (makes me feel weak)! 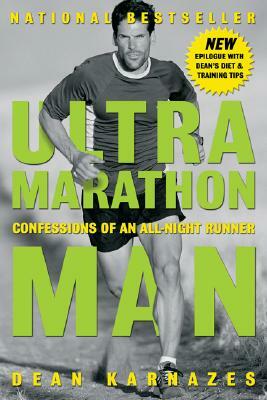 Okay, all you fitness and running nuts out there -- this is the book for you! This book will blow your mind. Why? -- you keep asking. Entertainingly written, Dean Karnazes talks candidly about his interior determination and excessive drive to run long distances -- without stopping (makes me feel weak)! "Heart-stopping stuff. The world's #7 biggest sports bestseller." "Full of euphoric highs. Rusisng with Karnazes [is] like setting up one's easel next to Money or Picasso... His book describes a journey into distance running that is much less about sweat than about the emotional terrain that unfolds at the frontier of endurance." "[Karnazes'] spirited memoir... can help mere mortals who want to push past their perceived limits or simply jump-start their sedentary lives." "Iron man Dean Karnazes is no mere mortal." "Makes the extraordinary look easy." "An exhibition of unadulterated courage and mental and physical stamina [for] anyone who likes to read about ordinary people doing extraordinary things." "Dean's masochism is a reader's pleasure." "The perfect escapist fantasy for couch potatoes and weekend warriors alike." "[Dean is] like a comic book superhero who remains undercover by day, every bit the unremarkable family man." "A real life Forrest Gump... [Karnazes] has pushed his body to limits that are beyond masochistic. They're inhuman."